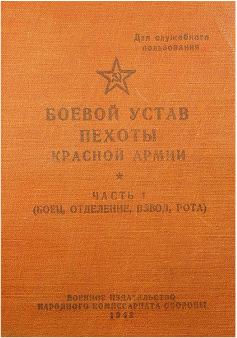 Red Army manual for the Infantry soldier, section, platoon and company, Vol. One. 1942. Use of Russian words of command. In the 13th Guards we use some basic words of command and drill movements, whether as part of our living history impression or battlefield re enactment. We use standard NATO transliteration and with a little practice is it relatively simplistic to learn. Also, at events it's use adds that little bit more authenticity and interest for the members of the public. Drill commands and movements are from the 1938 and 1942 RKKA Manual for Infantrymen. Generally commands consist of two parts. Cautionary i.e. section, platoon, company etc. Executive i.e. the movement to be carried out. The movement is generally carried out on the last syllable of the word of the executive word of command. The unit leader assembles facing towards the Commander and indicates where the unit is to form up by raising the left arm, horizontal to the ground at shoulder height and the order Vzvod, Stano-vees (Squad, fall in) will be given. At the run, the unit will form up in one rank in size order, tallest to the right positioned to the left of the unit leader. The soldiers adopt the Vol-nah (At ease) position, looking straight ahead, stand straight, heels together, shoulders back, arms straight down the sides touching the trousers, fingers curled to a loose fist, chin up, right leg straight, left leg slightly bent and relaxed. Once at ease, the unit leader moves to the front of the unit. At the order Ravnya-yees (Dress rank) all soldiers, except the right most soldier, turn their head to the right and take their dressing from the soldier on their right with 15cm(6 inches) between their right elbow and the left elbow of the soldier on their right. The unit will be given the order Smir-nah! (Attention) The soldiers will come rigidly to attention and snap their heads smartly to the front, chin up and looking straight ahead. The command Расчитайсь! Rah-scheet-ayees (Count off) is given. From the right, each soldier in the units front rank counts off by number. As the number is called out the soldier turns his head to the left and immediately snaps his head forward again. When the last man counts off, he steps forward one pace as it is called out and steps back immediately into line. The unit is given the order Vol-nah (At ease) who then resume the original at ease position, this time keeping the head and eyes forward. During roll call, when the soldier's name is called, the soldier assumes the Smir-nah position and answers 'Yest', then reverts to the Vol-nah position immediately afterwards. Depending on numbers present and prior to the inspection the unit may form two or three ranks. The ranks then are ordered into open/review order for the inspection. The unit leader resumes position on the right of the squad. For the inspection, the unit is brought to Smer-nah! (Attention). The Commanding Officer greets the assembled parade with the words "z'drast'vee-che-tyeh tovarishi!" (Good Morning Comrades) The unit respond in unison with "z'drast'vee-che-tyeh". The unit leader smartly marches out to greet the Commanding Officer and salutes. The Commanding officer returns the salute. Whilst both are holding the salute, the unit leader announces the unit is ready for inspection, "Tovarisch Kommandir (unit name/number) dlya ihn-spehk-tsee post-roh--yeh-noh!" The Commanding Officer orders Vol-nah (At ease), both then drop the salute and the unit leader turns to face the unit and repeats the command and the soldiers stand at ease. Thereafter, each respective unit present on the parade will be brought back to Smer-nah! (Attention) by the unit commander as the inspecting officer approaches that unit. After that unit is inspected it is returned to Vol-nah (At ease) whilst other units present are inspected. The inspection is conducted from the right to left of the front rank, then left to right 2nd rank, then right to left 3rd rank. At the end of the inspection the Commander steps to the side of the unit and salutes the unit leader, who returns the salute. The unit leader then resumes the position on the right of the front rank. "Numehr vihntovkeh?" (Your rifle serial number). On occasion a soldier may be called forward to receive an award from the commanding officer in the presence of the paraded unit. When the respective soldier or soldiers names are called by the commanding officer, the response is "Ya!" and when the ensuing command "Ka'mnya!" (Come here!) is given, the soldier(s) responds," Yest!" If the respective soldier is not in the front rank, he will tap the soldier in front of him on the shoulder, who will then step forward and to the right, so that soldier behind may step through the gap in the rank, who will march smartly to the commanding officer. The soldier creating the gap then returns to his original place. When the soldier receiving the award returns and is approaching, the soldier who previously created the gap, again steps forward as before to allow the soldier to rejoin the ranks. Neatness of hair, both front and behind. Pilotka's will be inspected for needle and thread, and to make sure no soldier is hiding cigarettes in the folds. Inside of belt for soldier’s number. o Tak-tochno (Exactly so) if Yes. o Nikak-nyet (Not at all) if No. the correct response would be: "Nikak-nyet Tovarishch Serzhant. The unit is briefed by the commander, and duties are assigned. If appropriate, the Commissar gives a briefing to the unit, to inform the soldiers of war news, raise morale and not least, to raise consciousness of the importance to the Motherland of the Peoples’ Struggle. The parade will be dismissed by being brought back to Смирно! (Attention), then given the command ‘Razoydis’ (Dismiss). On receiving this command, the soldiers will dismiss to their duties at the run. The last man standing is traditionally assigned extra duties! Pronunciation: Standard NATO transliteration has been used to render the English pronunciation of Russian. Things to note: English “u” in transliteration is a long sound, i.e. it’s pronounced as “oo”; Russian “е” is pronounced “ye” in English. See below for parade commands. When answering roll-call the response is “Yest!” (Есть!). [Literally “there is” – the formal response when the soldier’s name is called]. Slushayus (Слушаюсь) [literally “I obey”] when given an order to carry out or to acknowledge receipt of an order or instruction. Another formal military greeting to an officer was to salute and say “Zdraviya zhelayu Tovarishch [rank]”, literally “I wish you health comrade…[rank]”. An officer arriving on parade would stand facing the troops and say “Zdraviya zhelayu tovarishchi soldati” “I wish you health comrade soldiers", and the response from the whole parade is to return the greeting “Zdraviya zhelayu tovarishch (officer's rank)" “I wish you health comrade (i.e. Kapitan)"
To call out the pace when marching the numbers 1,2 or 1,2,3, are used (see below) because the Russian words for left and right have two syllables and are unsuitable for this purpose. The pace is called by all soldiers in a squad when learning to march (as in the British Army), or by a soldier in the front rank for trained soldiers to keep step on the march. (Raz is used for the number one when counting whilst marching, if talking about one thing the word [один] adeen is used). When stepping off it is always on the left foot. Simultaneously the right arm is swung parallel to the ground with the fist level with the belt buckle and the left arm back and vice versa continuing the march. Rate of march is 110-120 paces per minute. Forming single rank into two and three ranks. The command Nah Pehr-vee f'Toh-roy Rah-shih-tees (Count off by one's and two's) is given by the squad leader. The squad counts off by one and two's. On the command v'D'Veh sheh-ryen-gee stah-nah-Vees (Form two ranks) Those numbered "Two"step back one pace with their left foot and as their right foot steps back, the soldier moves to the right behind the soldier in front, then slides the left foot to the right to assume the attention position. Nah-Prah-voh! (right turn), Sohm-k'Nees! (Fill in) the troops dress forward into three ranks, then Nah-Lay-Voh! (left turn). Thereafter, the commands Ravnya-yees! (Dress ranks) and Smir-nah! (Attention) are given. The distance between ranks should be one metre apart. Opening rank distance for review/inspection. The order given is, Shahg 'peh-ryohd, Marsh! The front rank steps forward one pace, leading with the left foot. The orders for Dress ranks and Attention then follow. To reassume the close rank position the order, Shahg Nah-Zahd! is given. The front rank then takes one step back, leading with the left foot, followed again by dress ranks. The order given is, D'va Shah-gah 'peh-ryohd, Marsh! The front rank takes two steps forward, stepping off left, right then the left foot comes forward to assume attention. Simultaneously, the second ranks takes one step forward, again leading with the left foot. To reassume the close rank position the order, D'va Shah-gah Nah- Zahd! is given. The front rank takes two steps back and the second tank takes one step back, again each rank respectively stepping off on the left foot and followed by dress ranks. * Rifle, Carbine & LMG only, slung over the right shoulder. ** Rifle/Carbine slung over left shoulder pointing upwards above left shoulder & SMG slung over left shoulder pointing down towards right side. *** SMG only, sling over left shoulder, across back and under right armpit, weapon at 45 degrees across chest. Thanks go to Comrade Chris Tapster for preparing the transliteration. In the field the Platoon (Vsvod) consisted of a four man HQs (Platoon Commander a Jnr Lieutenant, Sgt and two messengers/runners) and three nine men rifle Sections (Otdyeleniye), or four Sections during war time. However, due to casualties and shortages the Platoon more often than not operated with three and sometimes two Sections. Also, there were two types of Sections encountered, type A light section with one LMG and type B heavy section with two LMGs. In understrength Platoons the LMGs were distributed evenly between the Sections. The Section Commander (Jnr Sgt) more commonly would be armed with a sub machine gun or semi automatic rifle, the LMG gunner may carry an additional weapon ie, either a pistol, carbine or rifle. One or two other sub machine guns or semi automatic rifles may have been distributed in the Section and the remainder carried bolt action rifles. The Section fell in according to their respective role on the left of the Section Commander and not in order of height as in garrison duties. The two messenger/runners would normally fall in at the rear of the platoon, to the left of the Platoon Sgt or on occasion at end of the Section(s) with the least men. O/g = Observer/guide man, usually a Corporal (Yefreitor) and Section 2nd in Command. R = Rifleman. The last man in the file would usually be an experienced or dependable rifleman. history displays and battle re enactments. Infantry of the Red Army dated 9th November 1942.